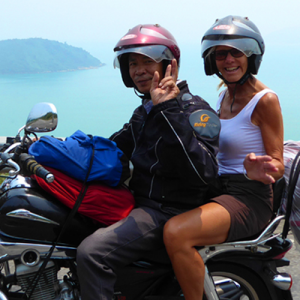 Hue Easy Rider is tour operator specializing in tailor made tours around central of Vietnam for groups of all sizes or individuals. We offer you custom and guided motorbike tours in Hue – Hoi An – Phong Nha, also the flexibility to choose your own path. You decide when and where to travel, pack in as many activities and locations as you like in Vietnam. We have friendly team of experts to give trip advice and assist you to craft the perfect trip. I have worked as guide since December 2008, I remember the first guest – Maria Falconer, Edinburgh travel with us three days. We had a tour of Hue and then two day long tours around the DMZ and up to the Ho Chi Minh trail. They also teach us many experience to work in travel industry. And now I hope that what I learn from my guest (language, work, culture,…) I can improve my services. If you have any question please contact with us via email.